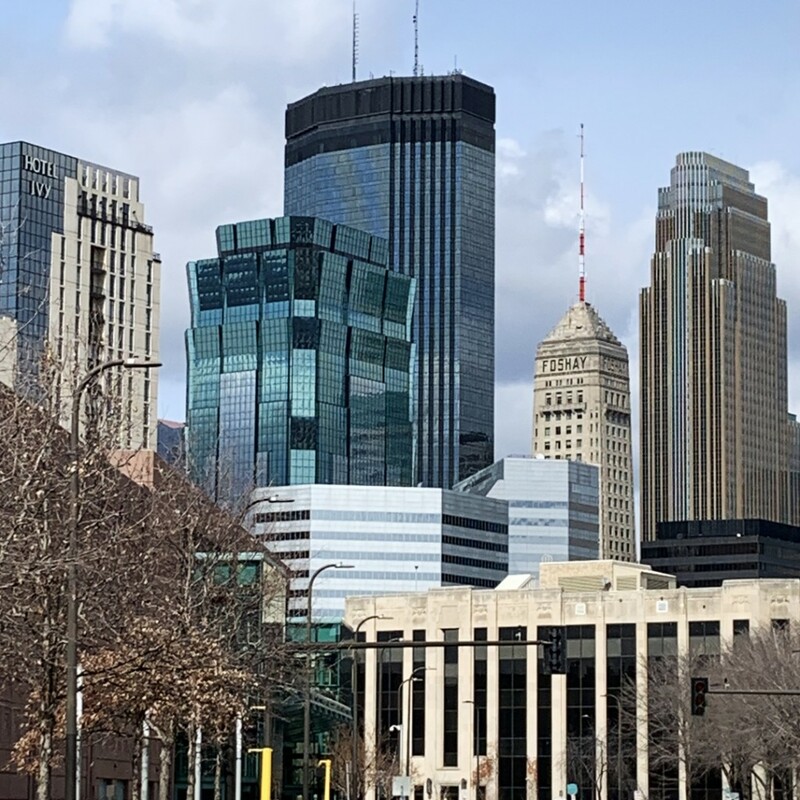 Just got home from a wonderful weekend in Minneapolis for NCECA 2019…. 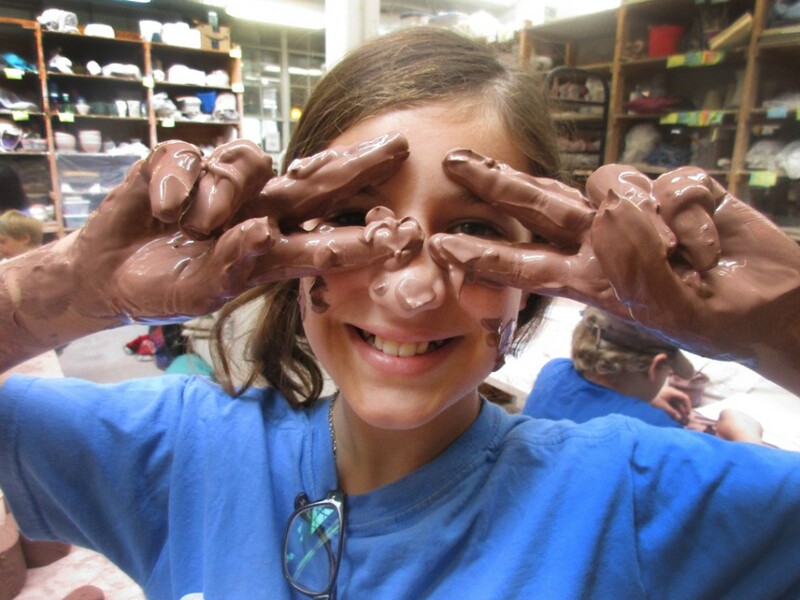 the National Council on Education for the Ceramic Arts. A lot of pottery, inspirations, shopping and meeting up with a lot of other pottery friends!! More photos & stories to come!!! 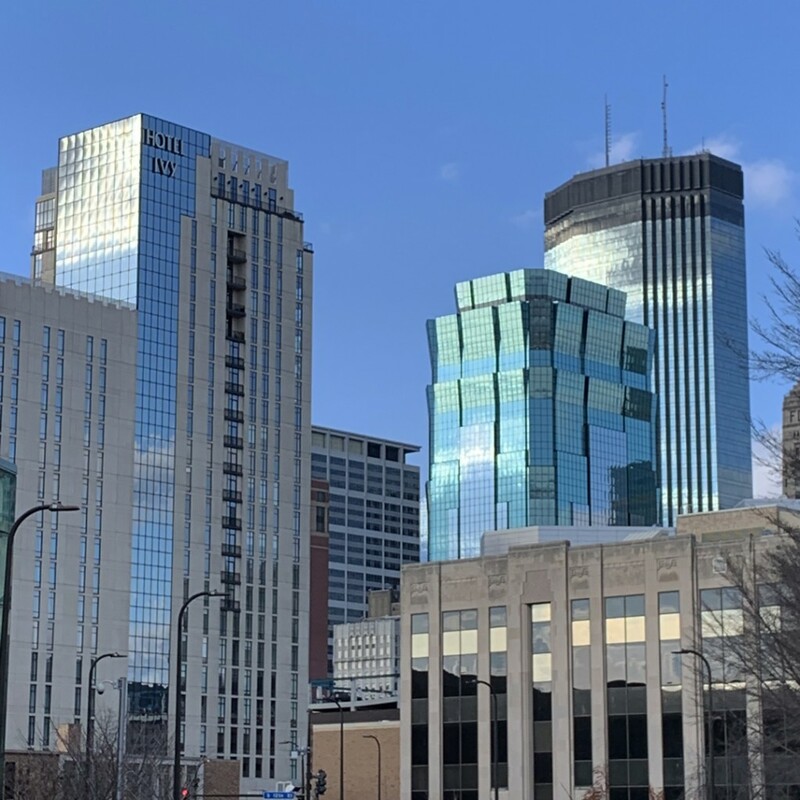 As an added bonus… it was a BEAUTIFUL weather weekend in Minneapolis! So I made sure to get outside to see some of the sights outside of the Convention Center too! now they need drip plates to catch the water after washing your berries! 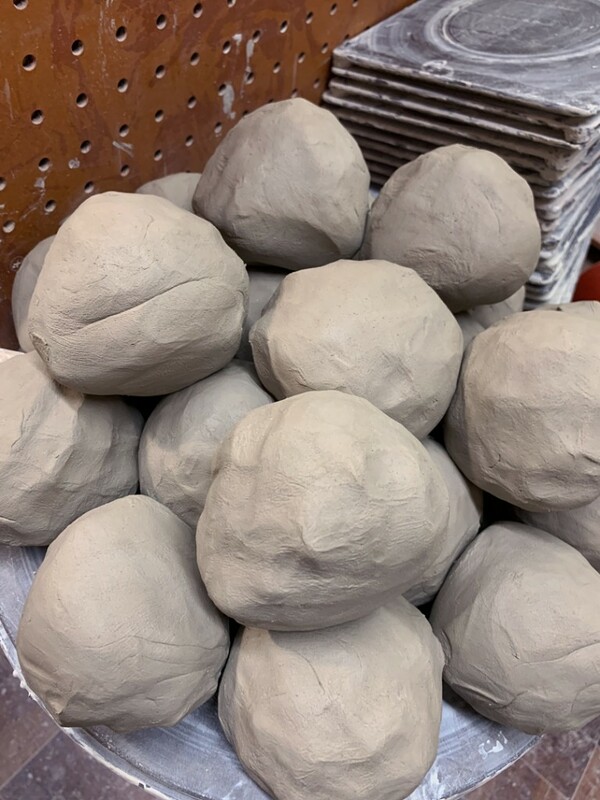 Wedged balls of clay… filled with potential… oh, what to make??? Ummm… something other than mugs maybe??? 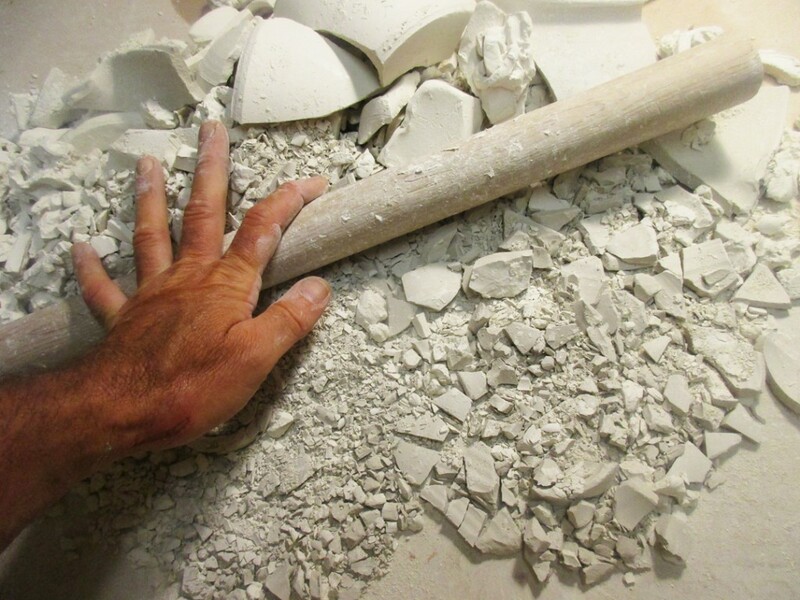 In one of the wheelthrowing rooms at Lillstreet, there’s a large plaster bat divided in two sides… one side for clean porcelain, the other side for everything else! 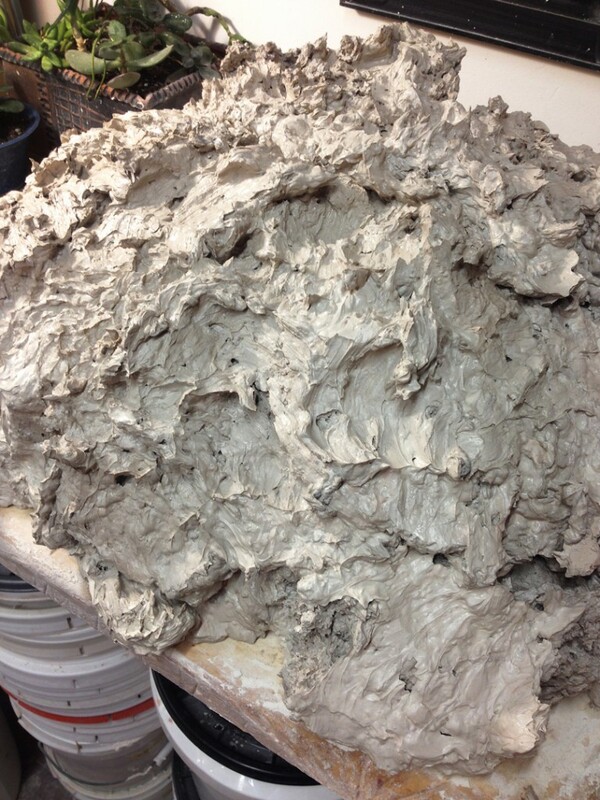 Apparently someone left a pile of reclaimed clay slurry on the plaster bat… quite possibly on the wrong side?!!! 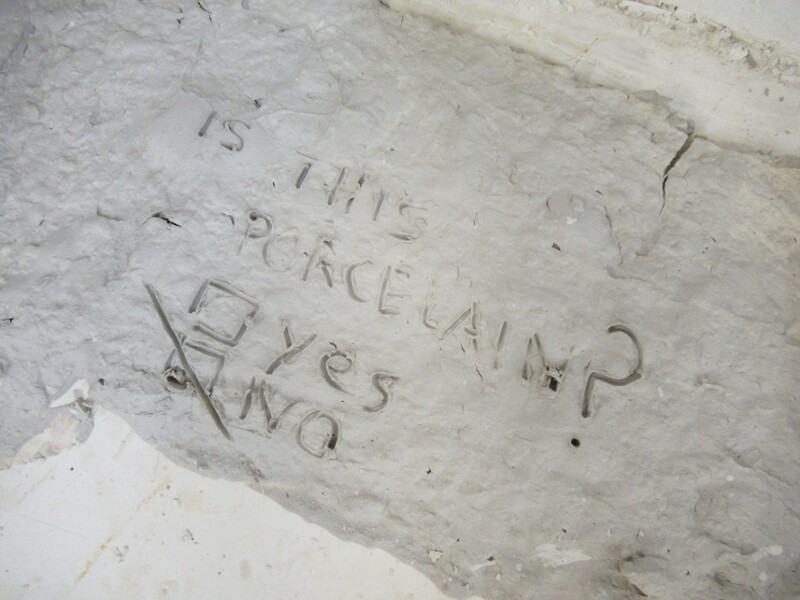 You’ve got to love the question… and the response… and the fact the clay is STILL there on the plaster bat!!! Unattended. Not claimed. Sure to be completely dried by the morning. 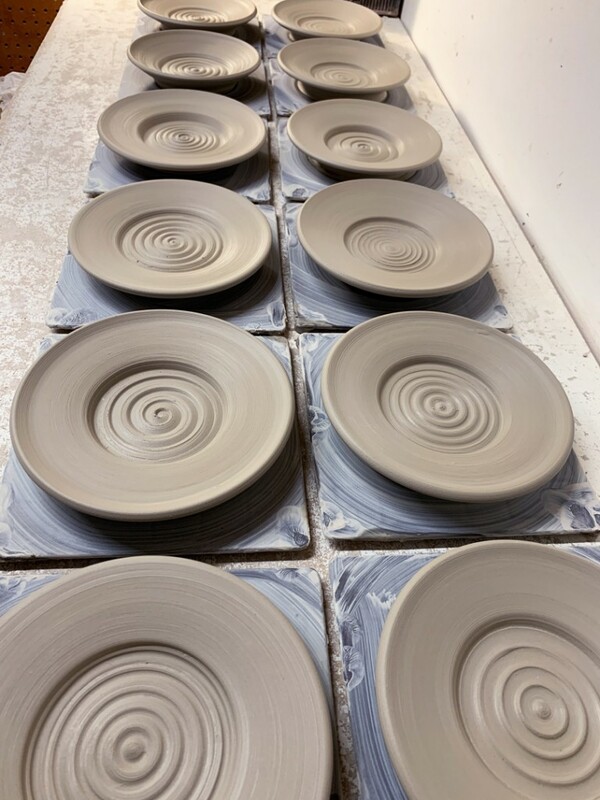 After a fun day outside, I finally made it into the studio to tackle that pile of reclaim clay I had set out a few days ago. Still a bit gooey, but with some wedging, layering, stacking & squishing, I finally got it all packed away into plastic bags. 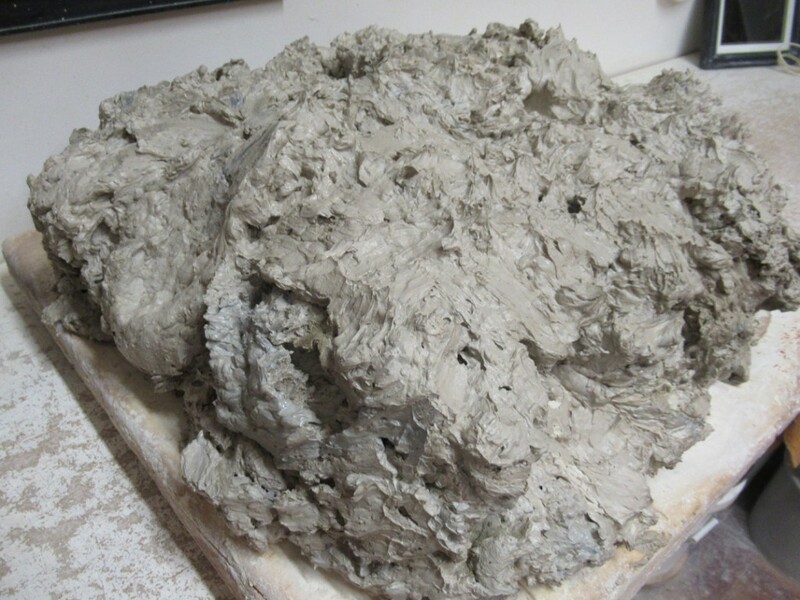 The “real” wedging will happen when I actually get ready to make pots with this FREE CLAY!!! 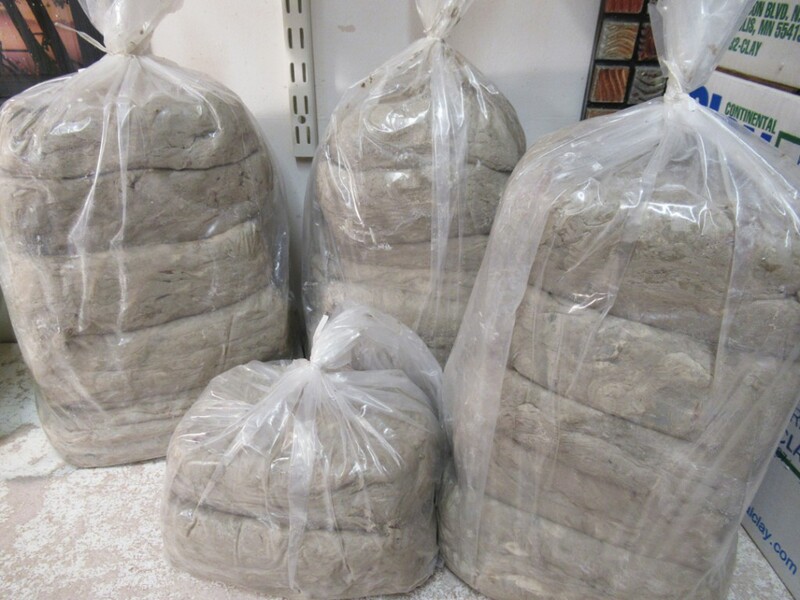 with another batch of “free” clay! 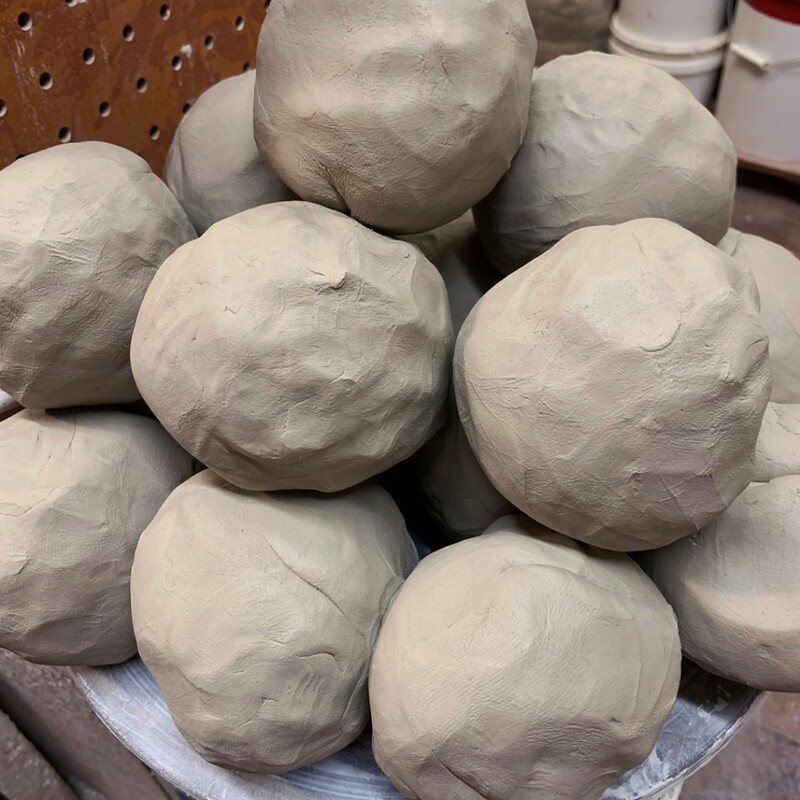 After a couple crazy weeks of getting ready for ART IN THE BARN, it felt great to be back in the studio “calmly” cleaning up, re-organizing and setting out another large batch of reclaimed clay! 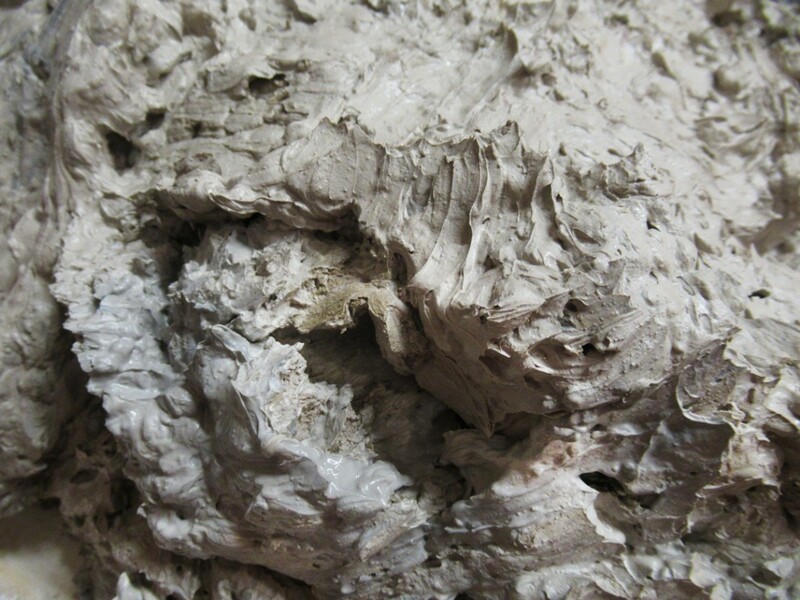 I’ve had some piles of dried clay in my studio for some time now. 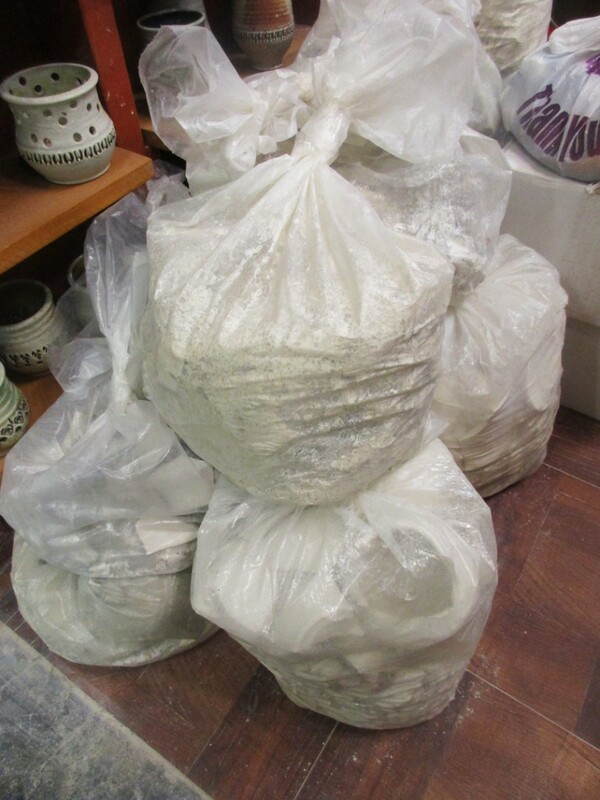 Bags & bags of dried porcelain scraps waiting to be reclaimed. 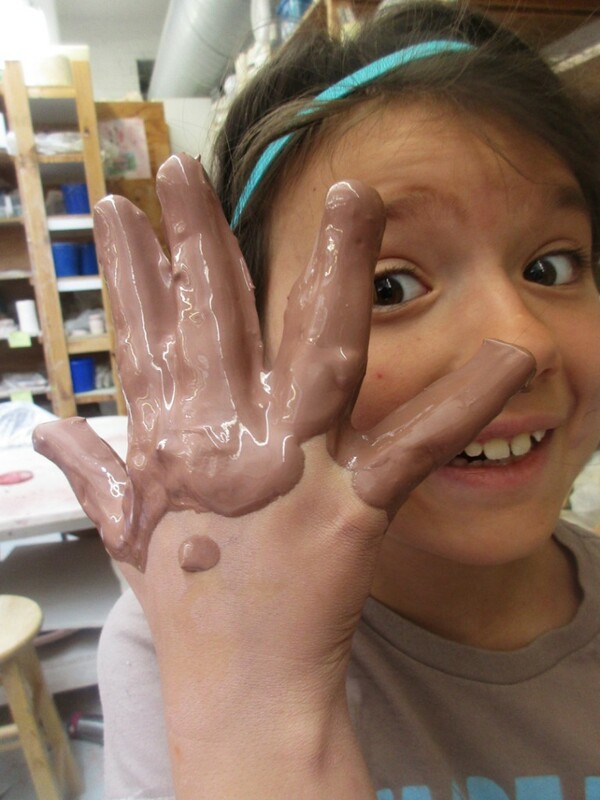 And the BEST part?… it’s all FREE CLAY!!! Because this is not even MY reclaim scraps! Instead, they are scraps from a potter friend of mine up in Minneapolis who doesn’t feel it’s worth her time & effort to reclaim her own clay. 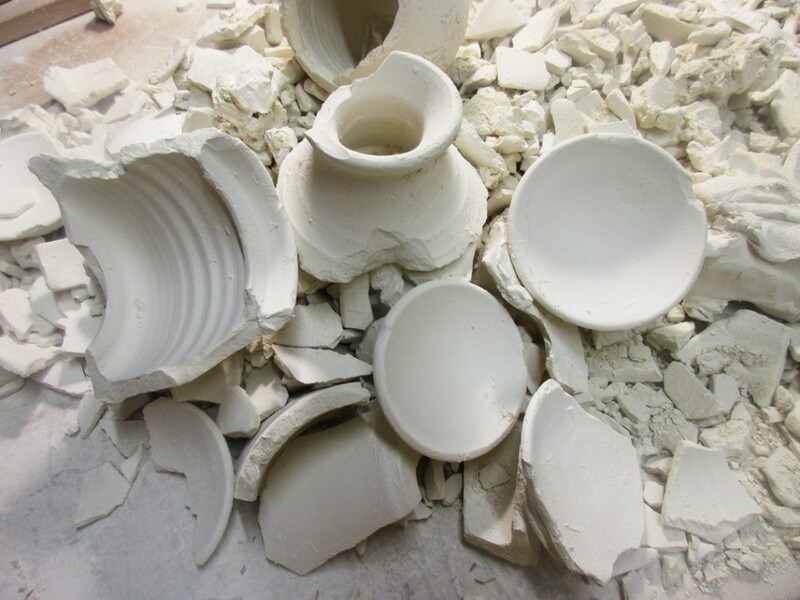 So I get to pick up her scraps every Spring when I go up for the Minnesota Pottery Tour. SCORE!!! So I took all of the dried scraps out of the bags a started breaking them up. 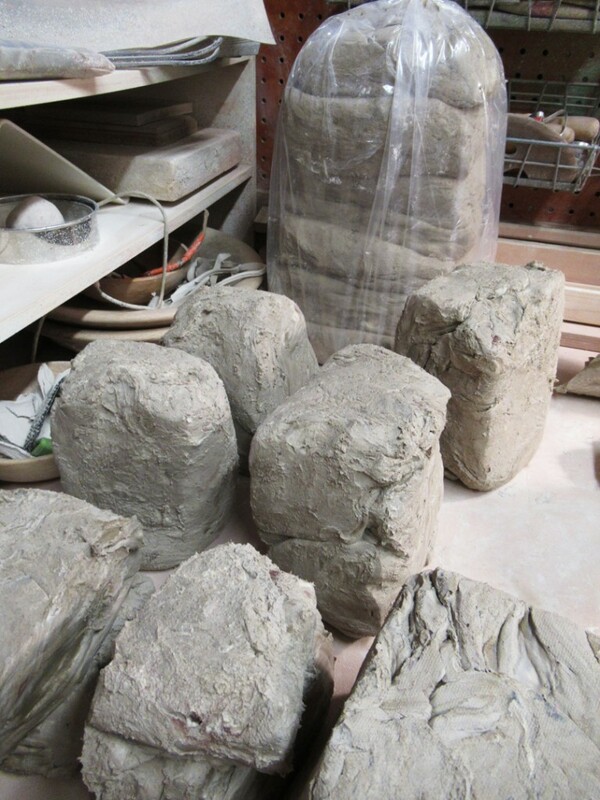 It was surprising to me how many large pots & pieces there were still intact in the bags? And what fun it was to bang them up & pulverize them into a fine powder. 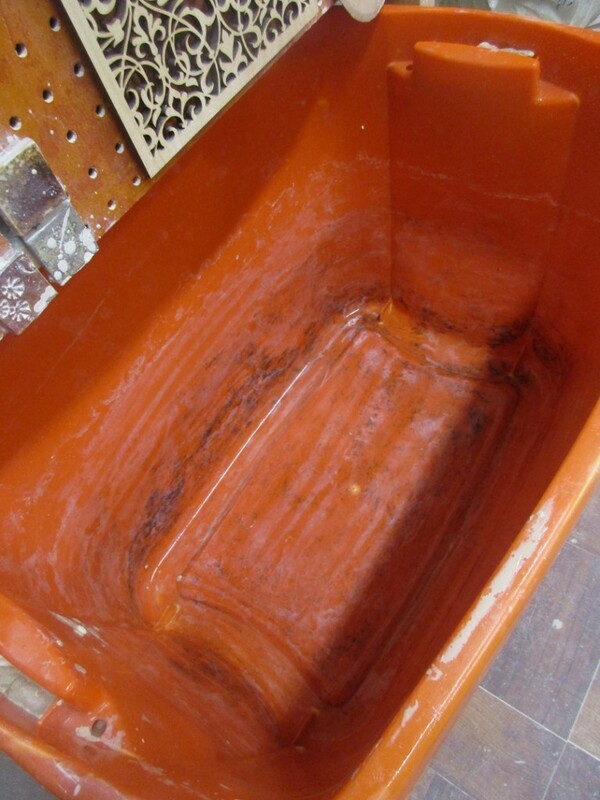 I also cleaned out my orange reclaim bin… as I had “dirty” stoneware in there last. And I wanted to start with a clean bin for my “clean” porcelain reclaim. 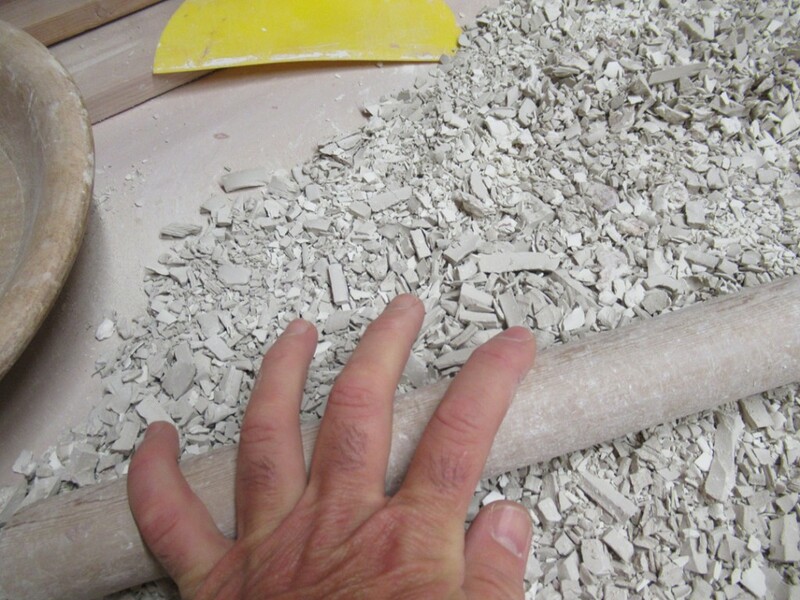 Once the clay was broken up & pulverized into small pieces. I started dumping it all into the bin. Good News. Bad News… BAD – There was more reclaim than my bin would hold. 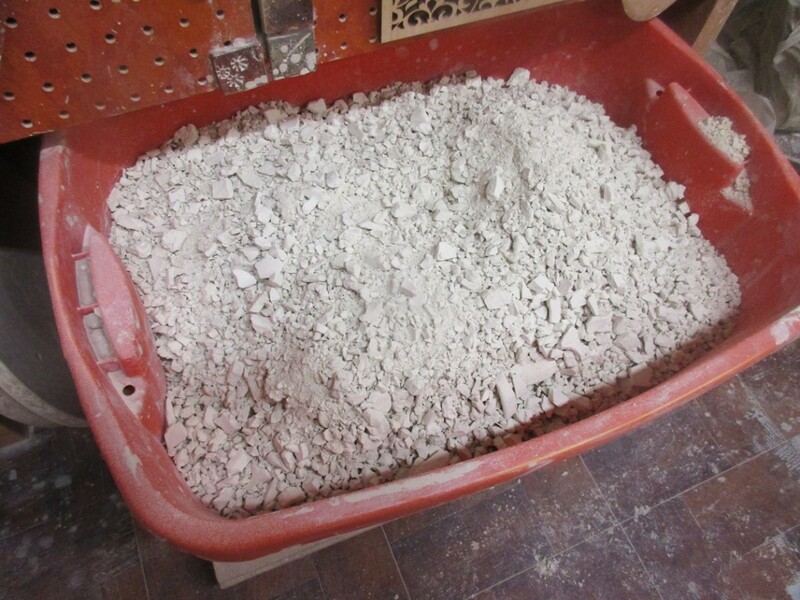 GOOD – There was more reclaim than my bin would hold so that’s A LOT of free clay! When the bin was full of scraps, I added a few buckets full of water. 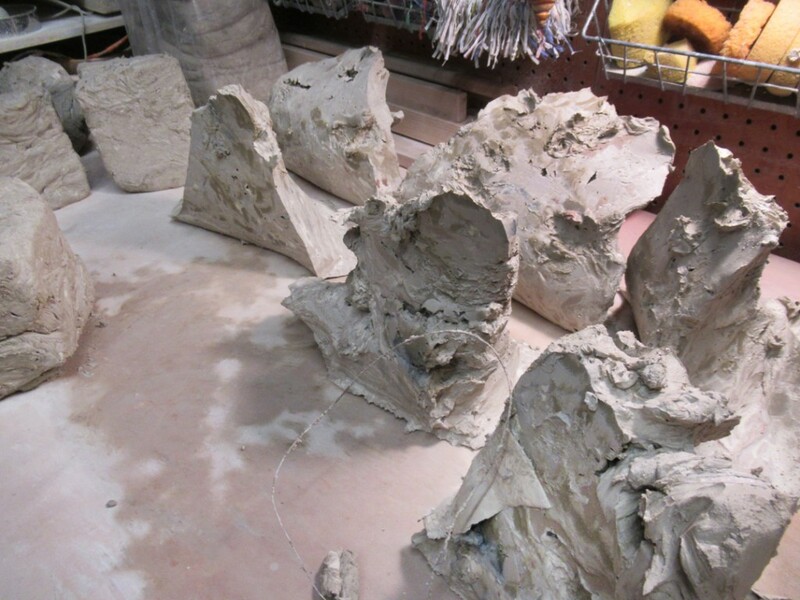 The plan is to “submerge” the clay scraps under water. I then took a long stick and stirred it up as best I could. 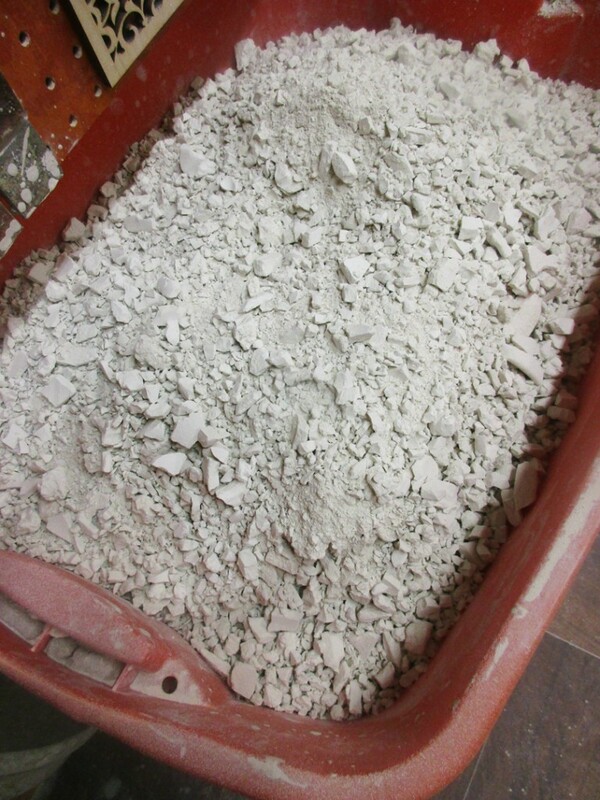 This orange bin of goopey clay will sit and slake down for a couple weeks while I work on other stuff. I’ll stir it up a couple more times, add some more water as needed. 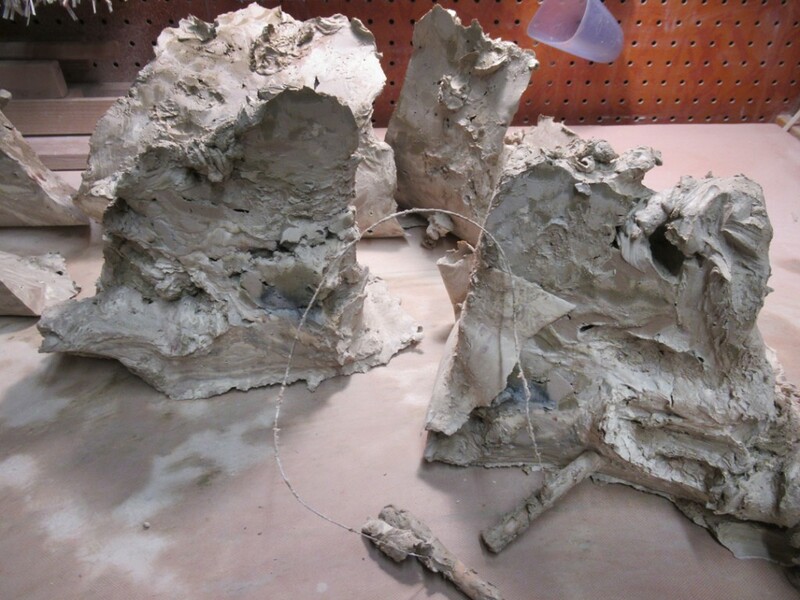 When I feel that it has all dissolved… and the extra water has started to evaporate, I’ll turn it our on the a lrage plaster bat to help get the excess water out… then it’s a LOT of wedging… but then it’s also a LOT of FREE PORCELAIN!!! 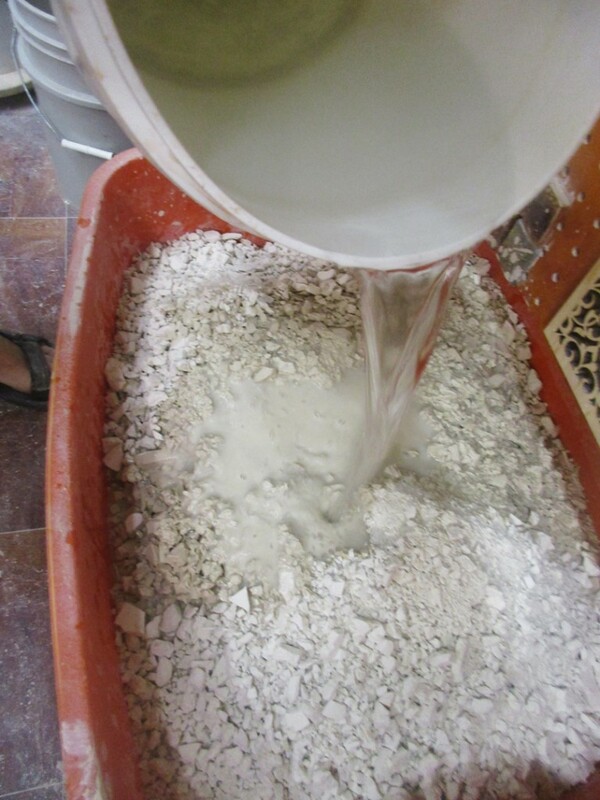 Apparently no one can resist a bucket full of smooth & creamy terra cotta slip?! As part of camp, I teach the kids how to make slip. 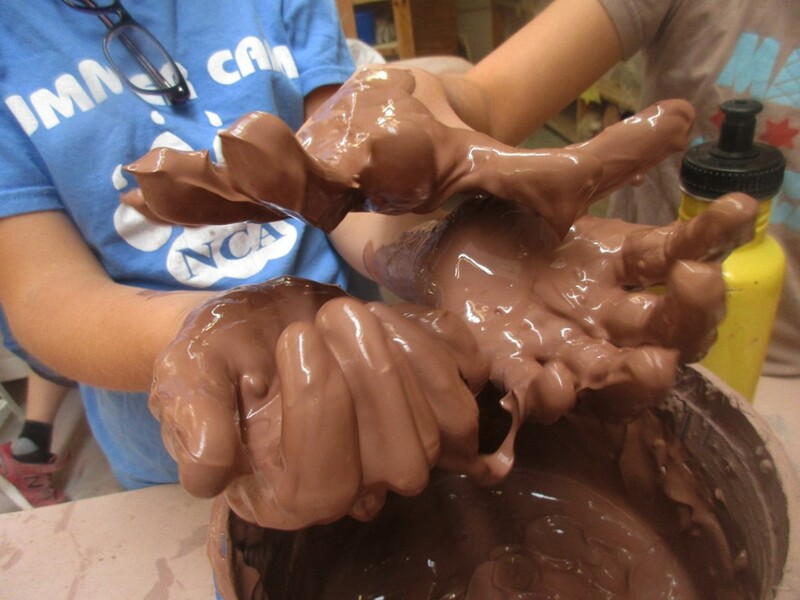 Actually, it’s kind of a “punishment” for letting their clay dry out too much to use. We try to keep everything under plastic while they’re working to avoid drying out. 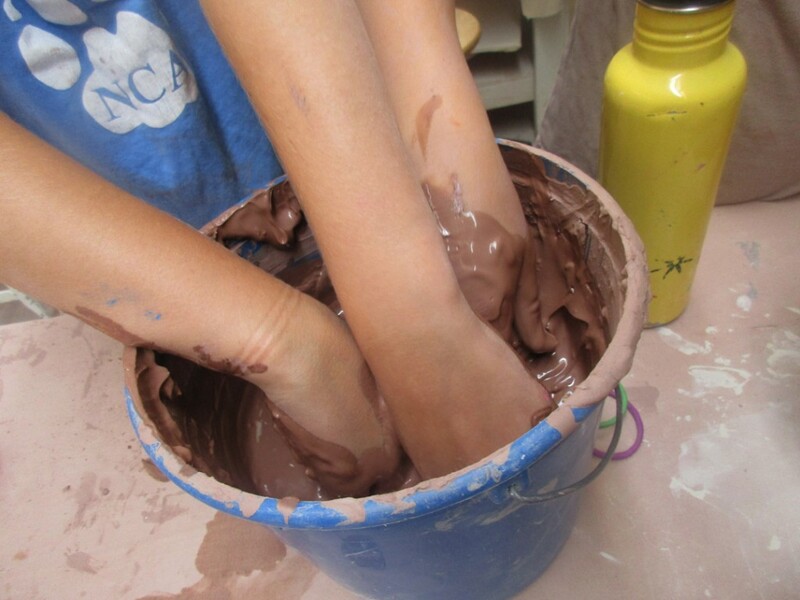 So to encourage them to remember, I make them flatten the clay out so we can let it dry completely. The next day the use a rolling pin to pulverize it as best they can so we can re-hydrate it back into a nice smooth slip. Apparently, the “punishment” is a bit too FUN for the campers!! !